The Sustainable Learning Networks in Ireland and Wales project was part-funded by the European Regional Development Fund (ERDF) through the INTERREG IVA Ireland Wales programme 2007-2013. The project was undertaken by the Centre for Enterprise Development and Regional Economy, School of Business, Waterford Institute of Technology, Ireland in partnership with the School of Management and Business, Aberystwyth University, Wales. The primary goal of the SLNIW project was to increase the competitiveness, creativity and innovative capacities and capabilities of small, medium and micro-enterprises in South-East Ireland and West Wales. The methodology chosen to achieve these goals was the creation and development of self-directed learning networks that, after some initial involvement from the educational institutions, would continue to operate under their own management, thus eliminating the need for further intervention from outside intermediaries and so establishing a cost-effective way for business owners to access learning as a business development tool. A key principle underpinning this project was to bring suitable businesses together, thus enabling participants to use the skills and resources of their fellow network members. This provided an extra business resource by delivering cost-effective educational, training and developmental benefits to SME and micro-enterprise owners/managers and their businesses, who otherwise may find it difficult to afford such benefits. LEARNING BY LINKING: ESTABLISHING SUSTAINABLE BUSINESS LEARNING NETWORKS details the selection, recruitment, and the development of the six learning networks through a facilitated phase designed to equip each network with the skills to enter the self-facilitated stage and to begin their progress towards to network sustainability. 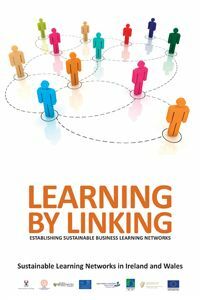 LEARNING BY LINKING provides context, content and process for academics, practitioners, enterprise support agencies and owner/managers of microenterprises and SMEs on how to develop sustainable business learning networks.